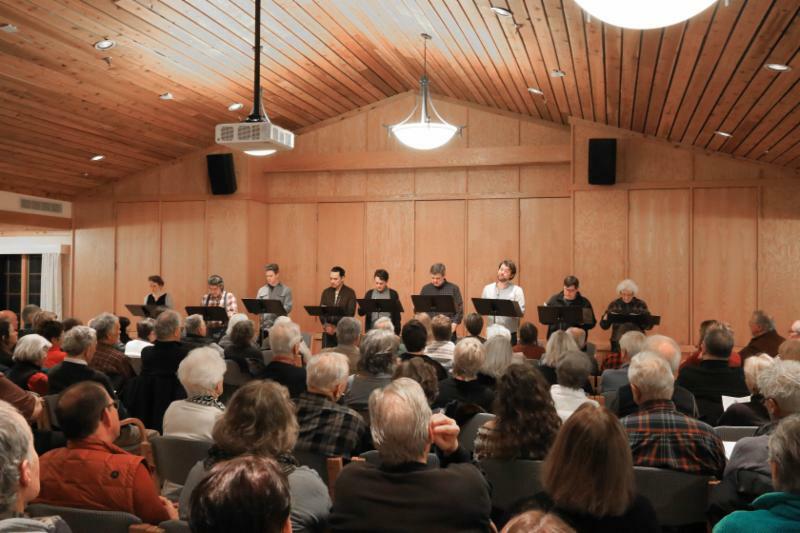 Peninsula Players Theatre presented a reading of Kristine Thatcher’s “Apparitions” on Monday, February 4 to a capacity crowd at Björklunden. Thatcher was commissioned by the Peninsula Players in the mid-1990s to write a play using Door County’s history and unique character as its major influence. “Apparitions” was produced as part of The Play’s the Thing, a winter series of play readings organized by Peninsula Players Theatre and with support from and in coordination with Door County Reads and its exploration of “The Death and Life of the Great Lakes” by Dan Egan and “Wintering” by Peter Geye. Participating in the reading were Peninsula Players veteran performers Cassandra Bissell (“Miss Holmes”), Neil Brookshire (“The 39 Steps”), Barbara Simpson Fuhrmann (“You Can’t Take it With You”), Noah Simon (“Once a Ponzi Time”), Mark Moede (“The Full Monty,”) Larry “Thor” Thoreson (“Population 485,” the reading) and newcomers Sam Hubbard, David Stobbe and Matthew C. Yee. The cast was under the direction of Greg Vinkler, the Peninsula Players’ artistic director. The Play’s the Thing is funded in part by a grant from the Wisconsin Arts Board with funds from the State of Wisconsin, as well as generous grants from Door County Medical Center and Friends of Door County Libraries and operating funds from Peninsula Players Theatre. The 2019 The Play’s the Thing series also includes “Tales of Men and Ghosts” adapted by Steve Pickering from stories by Edith Wharton, which will be performed Monday, March 4 and “Love, the Cracksman,” a new fast-paced comedy by Mark Brown on Monday, April 1. Both will begin at 7 p.m. at Björklunden. Seating is limited. Peninsula Players Theatre is America’s Oldest Professional Resident Summer Theatre. The Play’s the Thing is part of the Players’ continued winter outreach programming, presenting professional play readings for the public. Season and group tickets are now on sale for the 2019 season. Single ticket sales begin March 1. Learn more about the Peninsula Players 2019 season at www.peninsulaplayers.com or phone 920-868-3287.